In this construction video tutorial, you will learn the step-by-step process for making design of eccentrically loaded column that is a vital part of reinforced concrete design. The bars are divided as columns and beams. The column is geometrically appears as beam but loading differs when compared. Beam undertakes load perpendicularly while column undertakes axial. The column is further is segregated as short and long columns. Both the types are separated with ratio of length (a) to lateral dimensions (b). 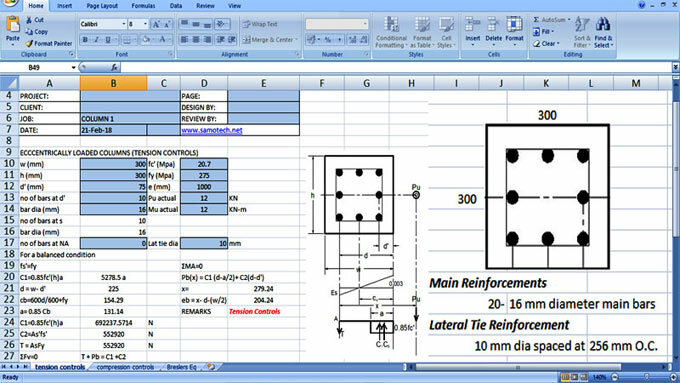 The long columns contain more (a/b) ratio with regard to short columns. The short columns, usually resist greater compressive loads. Long columns are utilized in axial load applications. To learn the calculation process in excel, go through the following link.